Design for Manufacture, Design for Delivery, Design for Evolution, Design for Operation and More. Design for X refers to the use of a formal methodology to optimize and improve a specific aspect of a design or product. Under the label Design for X, a wide collection of specific design guidelines are summarized. The variable X represents the areas of focus. Each design guideline addresses a particular issue that is caused by, or affects the characteristics of a product. The design guidelines themselves usually propose an approach and corresponding methods that may help to generate and apply technical knowledge in order to control, improve, or even to invent particular characteristics of a product. There exists a wide range of specialized fields of engineering, and considering the whole life cycle of a product will require non-engineering expertise. For this purpose examples of design guidelines are listed as: DFDE : Design for Delivery, DFD : Design for Deployment DFM : Design for Manufacturability, DFP : Design for Procurement, DFSC : Design for Supply Chain, DFT : Design for Testability, DFE : Design for Evolution, DFF : Design for Flexibility, DFP : Design for Portability, DFRU : Design for Reusability, DFO : Design for Operation, DFI : Design for Interoperability, DFP : Design for Performance, DFRC : Design for Regulatory Compliance, DFR : Design for Reliability, DFSA : Design for Safety, DFSE : Design for Security, DFS : Design for Serviceability, DFSU : Design for Sustainability etc. DFX : Design for Excellence. 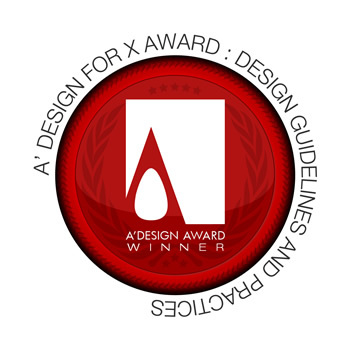 The Design for X Award is a unique design competition category that covers well designed products that have also been extensively improved and specialized for specific aspects. For example, a perfectly recyclable product, a perfectly customizable product, a perfectly deployed product etc. The A' Design for X Award is the indicator of quality and perfection in design, the award is recognized worldwide and takes the attention of design oriented companies, professionals and interest groups. Winning the A' Design Award is a certificate of excellence for designers, an important milestone in their career. Having the A' Design Award attracts the eyes of design oriented companies worldwide, winners will be able to find better and higher profile jobs & sales leads. The winners of the A' Design for X Award are provided extensive and exclusive marketing and communication services to promote the success of winning the A' Award. Award winning designs appear on the A' best designs book which is available worldwide, this book is furthermore distributed to the high-profile magazine editors, design oriented companies and relevant parties. The winning designs are also exhibited at our exhibition in Italy, and the best designs will be picked for the permanent exhibition. The winners appear on magazines, newspapers, webzines and many other publishing mediums. For concept stage projects, the A' Award is an early indicator of success. For realized designs, having the A' Award gives added value to your products and separates them from the rest of commoditized goods, it is an excuse to communicate your product to the media, a reason for press releases. Design for X award accepts entries from worldwide designers and enginners. Unlike some other design awards and competitions, you are not obliged to make any further fees for winning the Design for X award and everything listed in the winners benefits will be provided free of charge. When submitting to the Design for X Competition keep in mind that your submission will be evaluated on multiple dimensions, however, the greatest focus and attention will be given to the X aspect of the Design, as in Design for X (DFX); therefore, for this category a detailed PDF presentation is required explaining the X factor. The best designs are considered for their degree of innovation, human factors, ease of implementation and realization, depthness of development, and technical properties such as choice of materials and ergonomics, for the Design for X category, specially weight will also be given to the X aspect of your design. Please indicate this aspect in your research and challenge text fields when presenting your project. The Jury is composed of both Academic and Professional participants worldwide, such as chief executive officers or head designers of companies and faculty heads or professors. In addition, the A' Award features the focus group jury, which is composed of ordinary people to normalize the scoring by eliminating the bias on aesthetics and form sections, the votes of Professional, Academic and the Focus Group are weighted to determine the final result. The Aim of the Design for X Award is to attract the attention of design and engineering media, magazines, and industry leads to your business by means of creating publicity and dissemination and also to separate you from the rest of the actors in the design engineering sector by honoring your institution with a prestigious award. Each winner design receives the trophy, published online and at our best designs book, receives a certificate and sticker templates to be attached to the products, the A' seal of design excellence is also included in the winners package, this seal is valid for the entire product lifecycle without yearly fees. For a complete list of benefits click here. To learn more about winners' services here. And check the contents of the winners pack here. Award winners will be able to use a title that matches their nomination category: Such as "Design for Manufacture Award Winner". View previous period design for x winners here.